Backsplash or no backsplash? That is the question! 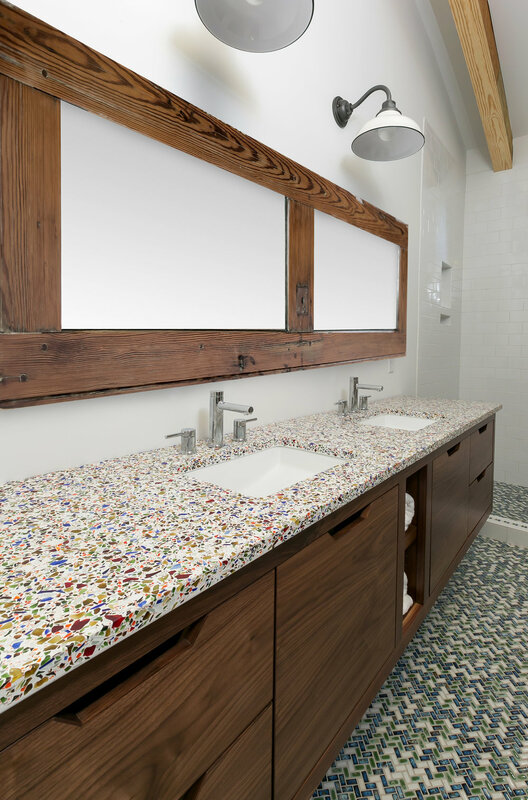 There are a lot of ways to approach countertop design; and we are, of course, partial to the recycled glass variety. While the chosen material makes a big impact on design, the direction to go with a backsplash is also a factor that gets a surprising amount of attention in talks about kitchen and bathroom trends. Among our clients, it’s about a 50/50 split between those opting for a backsplash or not. And when someone does choose to have a backsplash, the options are seemingly limitless. By definition, a backsplash is a vertical extension to a counter (typically in a kitchen or bathroom) which protects the wall from unintended splashes of water. In a kitchen, it also helps protect the wall from splattered grease when cooking or food splatter during meal preparation. In the event that the walls aren’t completely square, backsplashes can also serve to mask imperfections. Despite its clear functionality, why do some people choose not to have a backsplash? Some people simply prefer the simple, clean look of having no backsplash. For those opting to go without, it is important to seal the edges of the countertop so that water, grease and food don't drip down the backside of the counters and cabinets. In addition, it is important to have a durable wall surface for the occasional splatter. A semi or high gloss paint that is washable (particularly behind the stove top) is recommended. With all of the beautiful colors found in our recycled glass countertops, featuring one of the colors on the wall could make quite a statement. In contrast, opting to go with a neutral wall color will allow our countertops to be the star of the show. While there is something to be said for the minimalist approach, backsplashes are an obvious (and often affordable) way to play up a particular style in your kitchen or bathroom. We asked a couple of local Charleston designers to weigh in on their backsplash preference, and the consensus seems to be yes to a backsplash… but not a standard 4” one. One of the things that we love so much about our recycled glass countertops is that the design possibilities are unlimited! Our unique product can be used for both a countertop and backsplash, combined with another backsplash material or can become a one of a kind backsplash paired with a different countertop material. GlassEco Surfaces can be completely customized to compliment your space or reflect your personal style. Contact us to schedule a complimentary design consultation.